Rev. Harry Daniel Beeby, a British missionary to Taiwan for many years, passed away on March 18. A memorial service was held on April 2 in both Birmingham and Tainan to remember this missionary who loved Taiwan dearly and worked closely with Taiwanese pastors. Beeby’s memorial service in Birmingham was held at Weoley Hill United Reformed Church and more than 100 people attended the gathering. 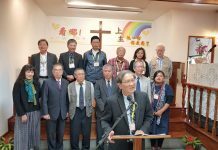 A few PCT representatives travelled to the UK to attend this service, including PCT General Assembly Clerk Lo Jen-kuei, Tainan Theological College and Seminary President Wong Chong-Gyiau, Taiwan Church Press President Joseph Chen, and Changhua Christian Hospital Chaplain Chen Ching-fa. Speaking on behalf of the PCT, Lo said that Beeby loved Taiwan far more than a Taiwanese would during the latter’s nearly 2 decades stay in Taiwan. “We will tell of your story to the next generation so that they will know,” Lo said. He was invited to offer the benediction at the close of the memorial service, which was followed by another service at Lodge Hill Cemetery and Crematorium. During the memorial service at Weoley Hill Church, Beeby’s daughter, Allison Beeby spoke about her fond memories of living in Tainan Seminary. She thanked all of her father’s friends for their partnership and support during his lifetime and said she was amazed at her father’s lifelong, 93 years long service for the Lord. 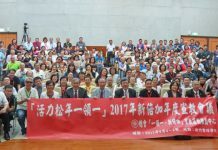 In Taiwan, the memorial service for Beeby was held in the auditorium of Tainan Theological College and Seminary on the same day as the UK. Participants stood to observe a moment of silence to honor Beeby. A short message was given by Rev. C.M. Kao, who had worked closely with Beeby during the drafting of the “Statement on Our National Fate” many decades ago. “When one person falls, 10 people will stand up. When 10 people fall, 100 people will stand up,” said Kao alluding to Beeby’s resolve and his legacy. He recounted Beeby’s contributions to PCT ministries and said that Beeby’s involvement in the crafting of the PCT’s “Statement on Our National Fate” prompted the KMT to revoke his visa and deport him in 1972. It wasn’t until the end of Martial Law, when the KMT de-blacklisted him, that Beeby was able to visit Taiwan again. Recalling Beeby’s forced departure in 1972, Kao said that a farewell service for Beeby was held at Thai-peng-keng Maxwell Memorial Church. After the service, the whole congregation walked with Beeby to the train station, singing hymns along the way. Beeby even thanked people for showing up to attend his “funeral” and people were sad and heavy-laden on that day because they didn’t want to see Beeby go. Born in 1920, Beeby was a missionary for the Presbyterian Church in the UK. Though his initial wish was to minister in India, he was commissioned to Hong Kong and Amoy in 1946 by his church. He later came to Taiwan as a missionary in 1949 after being expelled from Amoy by the Chinese government. When he came to Taiwan, he first taught English at Chang Jung Senior High School. Some time later, he befriended Shoki Coe, then President of Tainan Seminary, who invited him to help him at the seminary. Beeby and Coe became very good friends and the former was inspired by the latter’s passion for Taiwanese people and the land of Taiwan. Because of Coe, Beeby began to identify himself as a Taiwanese and work with the PCT to speak prophetically to the society at the time. The memorial service for Rev. Beeby in Birmingham was held at Weoley Hill United Reformed Church.